Victory is sweet: Paddy Hopkirk and Henry Liddon receive their winners’ trophies after the 1964 Monte Carlo Rally. Thanks to its then-unorthodox front-wheel-drive layout and diminutive size, the Mini was simply perfect for rallying right from the start. Half a dozen works cars made their appearance in the 1960 Monte Carlo Rally just six months after the Mini made its market debut. Private drivers entered six more of these small but mighty performers. Back then, however, the newcomer was not particularly competitive, as Peter Riley and Rupert Jones finished 23rd in the fastest Mini. A year later, the small cars from Britain were again unsuccessful, as none of the three works cars entered reached the finish line. All this changed dramatically in 1962, when Rauno Aaltonen, the Flying Finn, entered the Monte Carlo Rally for the first time at the wheel of a Mini Cooper. Unfortunately, this very nearly became his last rally, too, as his Mini rolled over in an accident, landed on its roof and caught fire. Aaltonen had just a few seconds to escape before his Mini became a victim of the flames. Only two other works Minis remained in the event, finishing the rally in the 26th and 77th positions. But two more names in the list of entrants were destined to soon hit the headlines together with the Mini: This was the year in which Timo Mäkinen entered Monte Carlo for the first time in a Mini Cooper, as a private driver, while the Sunbeam Rapier that finished third overall was driven by an Irishman named Patrick “Paddy” Hopkirk. The Mini became a factor in 1963. Hopkirk was back, this time at the wheel of a Mini Cooper, one of four works cars entered in the rally. Rauno Aaltonen was 1963’s most successful Mini driver. He clinched a class victory while crossing the finish line third overall. Paddy Hopkirk followed, arriving behind Aaltonen second in class and sixth overall. The two other Mini Coopers entered by the works team finished 28th and 44th. For 1964, the rally promised to be more exciting than ever. And what had become increasingly evident in previous years became clear on Jan. 17, 1964: The era of the amateurs was coming to an end, with more and more works teams now entering the Monte Carlo Rally. Back then, teams began from several locations, with all routes eventually ending in Monte Carlo. Starting out in Minsk, Glasgow, Paris, Frankfurt, Athens, Warsaw, Lisbon and Monaco—the latter naturally also marking the finish line—the teams were a colorful group. The ultra-powerful Ford Falcons with Greder/Delalande and Schlesser/Leguezec at the wheel were matched, at best, by the Mercedes-Benz 300SE driven by Böhringer/Kaiser and Glemser/Braungart. But Trana/Lindstrom, at the wheel of a Volvo 544, were also expected to look good, just like Toivonen/Jarvi in their Volkswagen 1500. Citroën entered no less than four copies of the DS19, but in terms of sheer numbers the French manufacturer still lagged behind the British. BMC alone registered an astounding six ultra-quick and nimble Minis. Private teams entered another 24. While today’s FIA World Rally Championship cars nearly rival Formula 1 machines in the technology department, things were a little closer to stock back in the 1960s. A new version of the Mini was entered for 1964: the Cooper S. Both power and speed had been improved. Engine displacement had been raised to 1071cc, with a maximum output of 70 horsepower. Not only did the higher top speed of 99 mph promise to make the Mini more competitive, but also—and, indeed, above all—much faster acceleration was now available. A blast from a standstill to 100 km/h now took only 13 seconds instead of 19. The rally began well for the Mini drivers, as the average speed of all cars on their 4000-kilometer trip to Reims, the meeting point of the “concentration runs,” was 31 mph. That may seem slow, but only 277 cars reached this first destination—all the works Minis among them. 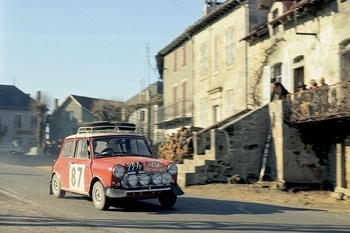 Then, in this historic French city, rally officials carefully made a note of the number plates on the three red Minis: 33 EJB driven by Paddy Hopkirk, LBL 6D with Rauno Aaltonen at the wheel, and AJB 44B piloted by Timo Mäkinen. The three cars with their white roofs were destined to become legend. The first leg of the rally ran to Saint Claude, covering a distance of 370 miles. After the 14-mile special trial between Saint Didier and Mont Main, the Ford Falcons with their mighty 4.7-liter V8 engines appeared to confirm their leading role, with Bo Ljungfeldt leading the field in his muscle machine. However, something small, yet potent, trailed in second: Paddy Hopkirk sat only 16 seconds behind in his Mini Cooper S. Third place belonged to Eugen Böhringer in his Mercedes 300SE, and Trana in a Volvo 544 was in fourth place. Timo Mäkinen sat in fifth place, behind the wheel of another Cooper. Still, the nimble Minis did not have a very good chance of keeping these leading positions, since they were simply not built for high speeds. And the next leg of the rally from La Madelaine to Pelle Autiers, near Gap, was a 281/2-mile full-throttle trial. This was reflected by the rankings at the end of the day: Ljungfeldt remained in the lead with his fast American Falcon, and Trana was now in second place in his “humpback” Volvo. But the Minis put up a tremendous show all the same, as Hopkirk dropped back only one place. Mercedes driver Böhringer sat in fourth place, while Mäkinen hung on to fifth. Entering the decisive and most demanding trial, the teams used all their resources and special ploys to achieve the best possible result: “Ice scouts” drove the route as late as possible before the start of the test in order to warn the drivers of critical spots. Prior to the “night of long knives,” Ljungfeldt’s Goliath was 65 seconds ahead of the “Davids” and their Minis. Now, however, Ljungfeldt’s big engine became a disadvantage. According to the event rules, teams with larger engines had to drive faster to avoid penalty points. As Ljungfeldt hurled his car through the serpentines up to Col de Turini and an altitude of 5271 feet, the weight of his Ford Falcon, the sheer size of the car, and the rear-wheel-drive layout proved to be a disadvantage in deep snow. The small Mini Coopers, in turn, more than compensated for their lack of power through their nimble handling and front-wheel drive. Reaching the finish line, Ljungfeldt was now only 17 seconds ahead of Hopkirk. And according to the handicap formula, Hopkirk was now in the lead with 2152.1 penalty points. Saab driver Eric Carlsson now sat in second place with 2183.2 points, while Mäkinen moved up one place, as his 2216 points put him just 0.2 points ahead of Ljungfeldt. Ljungfeldt pushed the Falcon around the circuit as fast as he could, with only Schlesser able to keep up. But Hopkirk didn’t give the Mini Cooper a rest, either. He finished only a half-minute behind Ljungfeldt and thus clinched victory. At the end of the rally, Hopkirk was the winner with 2536.2 points, Ljungfeldt finished second with 2566.7 points, and Carlsson was third with 2573.7 points. To round off the Mini’s triumphant appearance, Mäkinen was fourth with 2593.8 points, while Rauno Aaltonen crossed the line in sixth place with 2619.5 points. The works strategy proved successful, with Hopkirk and his two Scandinavian colleagues forming a joint team for the first time. At the end of the rally, the spectacular and eye-catching style of all three drivers convinced many that Hopkirk, Mäkinen and Aaltonen must indeed be modern incarnations of Dumas’ Three Musketeers. Other than the 1952 Monte Carlo Rally, when there was nothing but snow and ice in the Alpes-Maritimes, weather conditions for the 1965 running of the event were acknowledged as the most difficult ever. And instead of the final test on the Formula 1 circuit in Monaco, the teams now had to go back to the mountains for a second time, being required to cover 378 miles in a second tormenting night drive from Saint Claude to Monte Carlo, again racing through the Alpes-Maritimes under the toughest conditions. Visibility in dense snowfall was near zero. 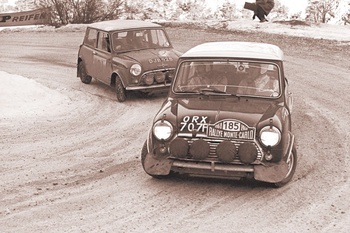 Ultimately only 35 out of the original 237 teams reached the checkered flag—three of them being Minis. Facing this kind of challenge, Timo Mäkinen together with co-driver Paul Easter continued the Mini Cooper’s story of success. They brought home a victory in the Monte, and despite the adverse conditions, were the only team in the entire field to complete the route without a single penalty point. Mäkinen put up an amazing performance as well, achieving the fastest time in three out of five special trials on the final ultra-difficult legs of the rally. Entering the last night eight minutes in the lead, Mäkinen won no less than five out of six special trials in this final part of the rally. This was Mäkinen’s first outing in a Mini Cooper with the new 1275cc engine, the one destined to become synonymous with this model. Mäkinen had set out from Stockholm with Hopkirk. Two other cars came from Minsk, and one each came from Paris and Athens. Hopkirk finished the rally in 26th place, closely followed by the brothers Eric and Donald Morley, who formed another works team. The Mini armada went for their hat trick in 1966, with the four Cooper teams being acknowledged as the prerace favorites and receiving lots of public attention. From the start, the teams lived up to this commitment, as Mäkinen, Aaltonen and Hopkirk left all the others far behind, finishing first, second and third at the end of the event. But then came one of the most questionable decisions in the history of the Monte Carlo Rally: After an eight-hour post-race technical inspection, the four additional headlights mounted on the radiator grille of the Mini Coopers were said to not comply with French homologation rules. Proceeding from this highly debatable point, the jury disqualified the first three cars. The Lotus Cortina that had finished fourth was disqualified for the same reason, and Citroën driver Toivonen was moved to the top of the podium as the winner. 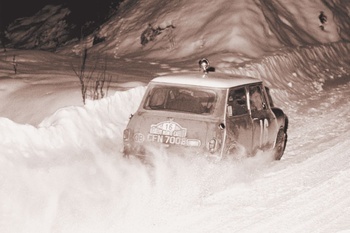 Notwithstanding the bitter experience of 1966, the Mini Coopers were back for the 1967 Monte Carlo Rally, as the Three Musketeers—Aaltonen, Hopkirk and Mäkinen—were joined by Simo Lampinen and Tony Fall. Entering the event as number 177, Rauno Aaltonen finally ended up in first place, 12 seconds ahead of the second-place Lancia. The other Mini Coopers likewise saw the checkered flag, with Hopkirk finishing sixth, Fall 10th, Lampinen 15th and Mäkinen 41st. 1968 was the last time the works Mini armada set out for Monaco, as something faster was needed to run up front. Larger cars producing more power had finally caught up with the Mini Cooper S, at least as far as international rally competition went. The Cooper S wasn’t a total embarrassment, however, as works driver Aaltonen finished third. Fall came in fourth, and Hopkirk finished fifth; Mäkinen was 55th at the finish line. Despite these excellent results, it was clear that the Mini Cooper S had passed its prime as a rally car. The legend, however, lived on even after the era of the Mini Cooper came to an end. 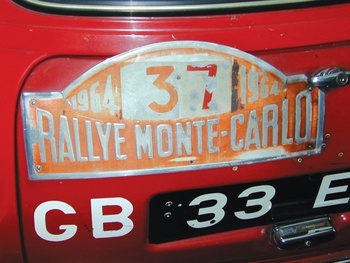 To this very day, every rally enthusiast knows the meaning of 33 EJB—the number plate on Hopkirk’s Mini Cooper S, winner of the 1964 Monte Carlo Rally. 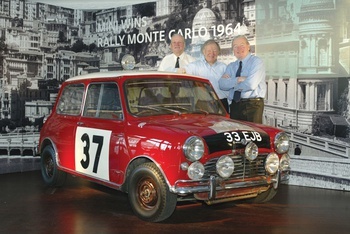 Paddy Hopkirk, Rauno Aaltonen and Timo Mäkinen pose with the legendary Mini Cooper that Hopkirk drove to the overall victory in the 1964 Rally Automobile Monte Carlo. In addition to the engineering talent of Mini designer Alec Issigonis and the tuning abilities of John Cooper, the Mini’s rally success can also be attributed to the men behind the wheel: Paddy Hopkirk, Rauno Aaltonen and Timo Mäkinen. So, are heroes born or are they made? That is a question that has piqued society’s interest for centuries. In 1964, these guys were young, barely into their 30s, and hungry for success. International rallying provided fun, adventure and a chance for fame, if not financial success. Most of us in the U.S. cannot fathom the popularity of rallying around the world. 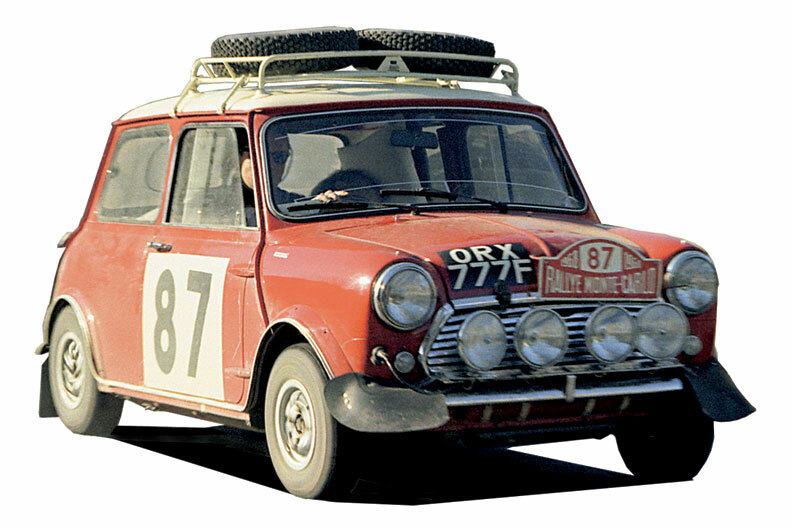 When Paddy Hopkirk won the 1964 Monte Carlo Rally, he received congratulatory calls from the prime minister of England—as well as the Beatles. Perhaps the bravest of the bunch were the co-drivers. Guys like Henry Liddon and Paul Easter sat there powerless, shouting instructions they hoped were correct to drivers they hoped could hear and understand them. With Mäkinen and Mike Cooper—son of John Cooper—in tow, we headed to an Irish pub that is Hopkirk’s local favorite. As we drank the night away and listened to the stories, it becames clear that Hopkirk and his crew live life large and are heroes not in the modern sense but in the Old West sense. Patrick Barron Hopkirk was born in Belfast, Northern Ireland, on April 4, 1933. After finishing school, he studied agriculture at Trinity College in Dublin for three years before taking up his studies in engineering. In 1955, he left school and started his career as a rally driver, first with Triumph and then with Rootes. During these early years in motorsports, Hopkirk developed business interests in Belfast with various companies such as the Paddy Hopkirk School of Motoring and Paddy Hopkirk Ltd, now called Mont Blanc Industri, which manufactures load carrying systems and accessories. Although Hopkirk never adopted Rauno Aaltonen’s style of left-foot braking—a style of driving destined to make inroads in rallying—he nevertheless became one of the fastest drivers in the sport, finishing third in the 1962 Monte Carlo Rally at the wheel of a Sunbeam Rapier. Despite this good result, Hopkirk felt that the Rootes Team failed to acknowledge his full potential, so he decided to switch over to the BMC Team, driving an Austin-Healey 3000. Hopkirk entered the BMC scene at almost the same time as the Mini Cooper, and after having thoroughly tested this small and nimble front-wheel-drive athlete, Hopkirk not only felt perfectly at home with the concept, but also set his focus on rally cars built to this principle. Driving the Mini Cooper, Hopkirk gained international recognition through numerous victories and top places in the most challenging events. Apart from victory in the 1964 Monte Carlo Rally, his greatest achievements include winning the 1965 and 1967 Circuit of Ireland, the 1966 and 1967 Alpine Rally, and the 1967 Rally Acropolis. Finally, in addition to rally competition, Hopkirk also entered road races such as the Targa Florio and Sebring. In 1970, two years after Lord Stokes, BMC’s chief executive, closed the Works Motorsport Department, Hopkirk withdrew from professional rallying to concentrate on his business interests. However, he has not completely let go of the sport, as he entered the RAC Golden 50 in 1982, the anniversary event celebrating the 50th RAC Rally. Together with co-driver Brian Culcheth and the very same Mini Cooper that had brought Timo Mäkinen victory in the 1965 Monte Carlo Rally, Hopkirk came home in first. Hopkirk also entered the Pirelli Classic Marathon in 1990, bringing home the title together with co-driver Alec Poole. As Monte Carlo has never lost its outstanding appeal, Hopkirk decided to try his luck once again in 1994, entering the rally in a new Mini Cooper together with co-driver Ron Crellin. Boasting starter number 37 and the L33 EJB number plates front and rear, Hopkirk battled it out against far more modern cars and came home with an impressive 60th-place finish, 30 years after his legendary victory. Rauno Aaltonen was born in Turku, Finland, on Jan. 7 1938, and from the very beginning he was fascinated by everything motorsport had to offer: At the tender young age of 12, he started racing fast boats on water, winning the Finnish Speed Boat Championship no less than seven times and even bringing home the Scandinavian Championship at the young age of 20. Another of Aaltonen’s passions was motorcycles, and he became a member of the National Speedway Team and won the Scandinavian Grand Prix in road racing on a 125cc Ducati. At the time, he majored in economic science and then dedicated his attention to rallying. During the summer, he battled for points at the wheel of a Mercedes; in the winter, he drove a Saab and won the Finnish Rally Championship in 1961. Rauno Aaltonen joined the BMC Team in 1962, entering the Monte Carlo Rally at the wheel of a Mini Cooper. Holding second place just three kilometers from the finish line, he misjudged a bend and rolled the car in a bad accident. The car immediately caught fire, and Rauno barely managed to get out and escape the flames in time. A year later, he finished third overall in the Monte Carlo Rally in his Mini Cooper and won his class. He finished seventh in 1964. After scoring a number of wins and leading places in international rallies, Rauno Aaltonen won the European Rally Championship in 1965. The success didn’t stop there, as he saw much success throughout 1966. In January 1967, with the help of the right tires and his inimitable style, he became the overall winner in the Monte Carlo Rally. In 1981, the government of Finland honored Aaltonen’s commitment to motorsports and road safety by making him a member of the Order of the Finnish Lion. Germany presented him with the Cristophorus Prize. Today, Rauno Aaltonen remains active in both motorsports and traffic safety as a popular driver and sought-after advisor. Timo Mäkinen was born in Helsinki, Finland, on March 18, 1938, and started his professional life by delivering newspapers for his father’s transport company. But he soon started racing in ice-track events, subsequently entering circuit races. In the late 1950s, he hit the headlines for the first time through his success at the wheel of a Jaguar D-type. Mäkinen entered his first rally in 1960, driving a car sponsored by the BMC importer in Helsinki. From that point on, he knew exactly where his future lay in motorsport: rallying. Soon he started to make a name for himself at the wheel of an Austin-Healey 3000 and the Mini Cooper, showing particular preference for the small, front-wheel-drive car: Mäkinen was one of the first drivers to prove the Mini’s potential, and he developed the right technique for scoring successful results in the sporting Cooper. This soon brought him to the attention of Stuart Turner, BMC’s team manager, who hired Mäkinen for the 1962 RAC Rally, in which Mäkinen finished seventh overall. Assisting Mäkinen as the co-driver in an Austin-Healey 3000, Christobel Carlisle described the Finn’s style of driving in the following words back in 1963: “After three hours of driving over one snowbound pass after another, all I wanted to do was take the next plane home. Quite honestly, I was scared out of my mind. He kept on and on at 130 km/h, power-sliding round every bend. “But nothing ever went wrong. So I gave in to destiny. And at the end of the rally, I believed in Timo so strongly that I was able to push him even harder in order to meet the time limit.” This, perhaps, explains Mäkinen’s outstanding performance in 1965, when he won the snowbound Monte Carlo Rally far ahead of the competition. Racing the Austin-Healey 3000 and the Mini Cooper, Mäkinen scored one outstanding result after another. His victories at the wheel of the Mini Cooper include the 1964 Tulip Rally, the 1965, 1966 and 1967 1000 Lakes Rallies, and the 1966 Three Cities Rally. In 1968, he switched over to powerboat racing and immediately claimed the Finnish Offshore Championship, subsequently winning the Round Britain Race in 1969. Timo Mäkinen, no relation to four-time WRC champion Tommi Mäkinen, continued rallying for Ford and Peugeot well into the 1990s, and like Hopkirk, entered the 1994 Monte Carlo Rally at the wheel of a new Mini. Unfortunately, technical problems kept Mäkinen from reaching the finish line. Join Free Join our community to easily find more Mini articles. To personally celebrate the legend of the Mini Cooper S rally team, we recently drove some stages of the Monte Carlo Rally in both classic Coopers as well as the new car. Considered some of the most treacherous territory in the rally, the route we drove is located near Monte Carlo as well as the famous Col de Turini. 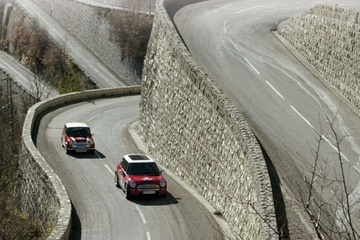 This series of intense switchbacks is more hill climb than a rally or road race. While we got lucky weather-wise (for February, anyway), we still had a small amount of ice and snow on the road. In 1964, Hopkirk, Aaltonen and Mäkinen didn’t get off so easily, as these same roads were covered in snow and ice. In a word, insane describes this kind of driving. Picture an event that makes the Chimney Rock or Hershey hill climbs look easy. Then run it at night and in a snowstorm. If that doesn’t scare you, run it when you are dead tired and on 1964 tire technology. These guys were certifiably brave as hell, and amazingly talented drivers. The Mini might have seemed like an underdog, but it really wasn’t. Its small size, front-wheel drive and great handling were really a pretty good choice for this type of work. The Mini’s main competition that year was the V8-powered Ford Falcon, another car that’s no stranger to us. On the few dry straight sections, we would choose the V8 power; but on switchbacks or in any kind of adverse weather, we would have chosen the Mini hands-down. Not only is the Mini a more nimble machine, but we’re pretty sure the Falcon would have required a few three-point turns—the road is just that tight.